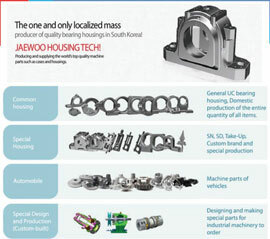 Established in 1998, Jaewoo Housing Tech specializes in manufacturing industrial machinery including bearing housings, cases, etc. based on the world’s top-level technologies. Those products are exported to European and American markets, continuously increasing the brand awareness of the company in the global market. Long years of its aggressive moves and accomplishments are fruits under the philosophy of “First releasing products than foreign competitors in China, Japan, and Europe.” Consequently, such an approach partially led to the localization of the advanced technologies leading overseas markets. Jaewoo Housing Tech, with innovative colors and design, has been energetic in pioneering new overseas markets. The maker focused not only on exterior design, but also on functionality of products. With its own patented technologies, the maker adds heat treatment by penetrating resin-kinds of paints into steel. When compared to the existing products, the rate of corrosion resistance is elevated by more than 60 percent and so the occurrence of the paint removal is fundamentally prevented. All of its bearing housings are now under the status to swiftly respond to any urgent orders on the spots. And after development of new models of products, release time can be also promised within shorter periods than any competitors, saving time and costs for potential customer companies. Filed Under: KOTRA Tagged With: bearing cases, Bearing housings, industrial machinery, Jaewoo Housing Tech Ltd.